Candy haul was modest and the boy didn’t get to meet up with his best buddy, but I got to eat a really good pizza. 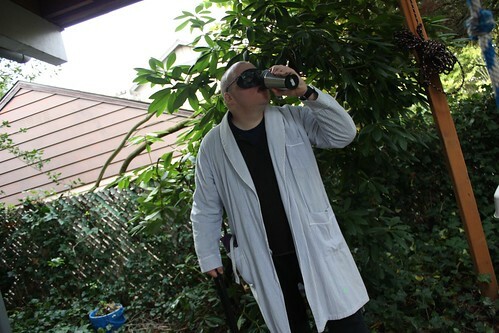 For the record, three adults recognized that my son was dressed as Zangoose and four more pegged him as a Pokemon. Only two kids recognized him as a Pokemon and none guessed the type. Nice! I was Pikachu one year, back before inflation hit the pokemon ranks. Zangoose > Pikachu, anyday. The coolest costumes I saw last night were those glow-in-the-dark stickman ones. At first I thought the boys had failed at Tron costumes (though why anyone would want to dress up as someone from that movie escaped me), but then I saw them running around in the dark and…yeah. It was cool. 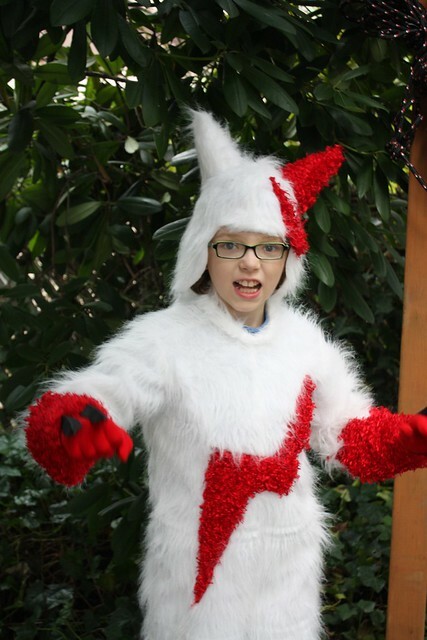 That is an awesome Zangoose costume! The coolest costume I saw last night was Fone Bone, with a great big papier mache head to make the proportions perfect! I wish I’d gotten a picture. It really is. My wife outdid herself yet again.